I was very pleased with the tunic. Others ask where I got it, as they would like one too. Comfortable & Classy! Very nice quality, beautiful pattern for year round wear. I bought both two: one Ivory & the other Red as pictured. Probably should have ordered it in a Medium, the large is generous...but I do appreciate the flattering lines that skim over various jeans, leggings and can even be worn as a coverup. It is great length for a top...about mid thigh, my height is 5'6 however, for someone shorter it may even be worn as a dress. Quite versatile; looks dressy enough for a graduation celebration, wedding, out to dinner or even a backyard party. The multi colors in each make it easy to match just about every shade of pants or leggings I already have. This top will not wrinkle! It is like a liquid fabric that you can toss into a carry-on with no worries. I travel a lot so that is a real plus! Excellent for wearing on a long flight to arrive looking put together with no fuss. Nice accents on sleeves & hemline as you see in the picture. Sleeves are not tight, just perfect length equal distance from elbow to wrist. Works for any age group. Very pleased so far, haven't had a chance to wear or to wash yet, (just got it the day before my trip, it is in my bag now) but should hold up quite well. I consider this dressy casual tunic top a real winner! Love this top. Fits well and is very comfortable to wear. Have lots of compliments on vivid colors and style. I like 3/4 length sleeves and the tunic length is good for pants or leggings. I have bought several tunic tops on line. They look so nice in the picture, but once I receive it and try to wear it, it does not fit or look good. 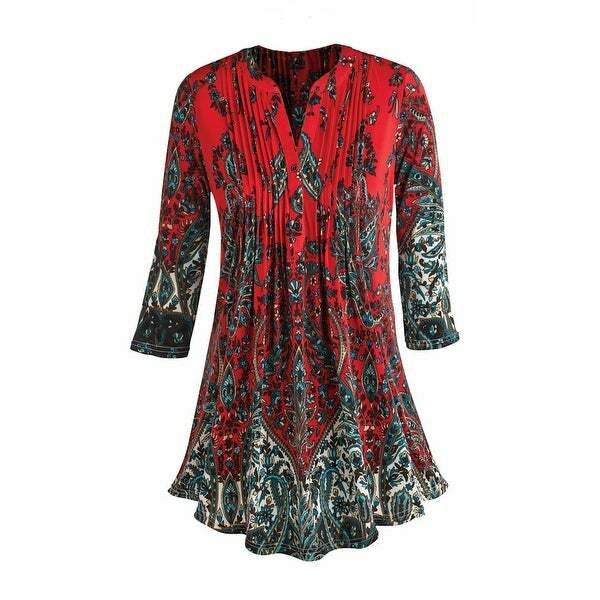 This tunic top is very nice looking and looks very good with slacks or over leggings. I'm very pleased with this tunic top. Three loves, for me, equals it's the best. As others have reviewed, it drapes beautifully, washes well and is very flattering. I hope to order another at least in the ivory if they are still available. So far, this is one of my favorite tops in my wardrobe. I ordered the red and the colors are bright and cheerful. It hangs really well and is plenty long enough to wear with leggings. The fabric is very soft and it just feels good on. I would definitely recommend to anyone thinking of ordering and hesitating. JUMP!! It took a while to get this top. It is very pretty but it is very big. I order a size medium and I wish I would have purchased the small. It's pretty and looks great on, but the fabric is heavier than expected and doesn't breathe. Better for fall wear. Beautiful print and very comfortable. Very pleased with my purchase and the price. its as pretty as the picture. love it. Tunic was larger then marked.It was very pretty and felt great but had to give it away. The fabric was not what I expected. Beautiful top. Wore it for Christmas. Pretty Fabric, nice fit. Really like the way it's cut, I have a similar one from another company, this was same quality and less expensive. Love this! Soft & very pretty. I received a lot of compliments! "could the purple color offered be shown? Like to know if it is a deep purple or what I call a shockingly bright purple. Thanks so much"
"I am 5'7" 125 lbs. Can anyone advise between the small and the medium for me?" I had to get a medium, 5' 8" 145lbs so I would think a small would work. It runs a little large. "Could someone please provide a bust measurement and tell me if the item is a relaxed fit. Not sure what size to order." I am a size 44DD and ordered a 2X, fits great. It is a relaxed fit and hangs loosely. So comfortable. I liked the looks of it and I needed a new top for a banquet. It's hard to find tops for plus size that don't look old lady. "What fabric is garment and what is your return policy "